Parallels? Remote Application Server (RAS) enables manufacturing to deliver applications and desktops to any device, centralizing and simplifying IT operations. Application virtualization allows employees to access resources and work from any location. Ultimately, IT leaders are able to reduce downtime in the manufacturing plant and maintain production targets. Aviso! Preencha todos os campos obrigatórios. Make Windows line-of-business (LOB) applications available on any device. Improve employee productivity with on-the-go access to full-featured applications while working across various production sites. Enable regulatory compliance with encryption protocols and advanced filtering. Continue to utilize legacy applications and hardware while implementing new transformative technology. Provide instant web access to virtual workspaces from HTML5 browsers. With Parallels RAS, manufacturing organizations can increase workforce mobility and productivity by allowing employees to access virtual workspaces from anywhere. IT administrators can consolidate and centrally manage data, desktops, and applications, while improving users’ experience with easy, instant, and reliable access. 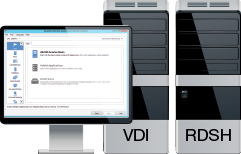 Parallels RAS simplifies the deployment and the maintenance of IT infrastructure by providing configuration wizards and automated processes to manage virtual desktop infrastructure (VDI) and Microsoft Remote Desktop Services (RDS). Additionally, IT administrators can centralize all of the business’ data, applications, and desktops in a secure and monitored farm, hosted on-premise, hybrid, or public cloud deployment. Employees on the production floor must have access to production applications at all times. By delivering real-time information to employees on demand, companies can make informed decisions faster and exceed production schedules. Parallels RAS has the ability to combine applications and their dependencies into an isolated container. Containerized applications can be run on any Windows server, no matter the underlying OS. This allows users to simultaneously access multiple versions of the same software without creating any conflict. Hardware refreshes and legacy-tailored software updates in the manufacturing industry require complex, lengthy, and expensive resources in order to make them compatible with any OS or device. With the desktop replacement function of Parallels RAS, organizations can reduce expenses associated with hardware refreshes because they are able to use any Windows workstation, including XP, 7, 8.X, and 10. In addition, Parallels RAS supports any Windows Server version from 2003/SP2 onwards, enabling legacy applications to run without the need for software refactoring. Streamline manufacturing IT with a centralized and secure approach to managing line-of-business (LOB) applications, shared desktops, and critical customer data. Parallels RAS provides manufacturing staff access to cutting-edge technology across remote facilities. Parallels RAS built-in server and gateways resourced-based load balancing help IT administrators to create a high-availability solution without significant time or budget overhead. Organizations can provide users with high performance, reliable, and stable connections to virtual workspace anytime. Parallels RAS centralizes virtualized application management, patches, and deployment, enabling IT staff to update applications only one time on the server and not on the device. Users have instant access to the latest software version from workstations, thin client, and mobile devices without local configuration. Provide manufacturing employees instant and secure access to line-of-business (LOB) applications and information on any device—including Windows?, Linux?, Mac?, iOS, Android?, thin clients, Chromebook?, Raspberry Pi, and more. Parallels RAS empowers manufacturing organizations to address data security issues by protecting information against unauthorized access. IT staff can determine user access policies by applying granular and advance filtering (by device, IP address, group, and Mac Address), two-factor authentication (2FA), and smart card identification. Você é um revendedor ou um prestador de servi?os de TI?